It’s no secret that I love literature based learning. And while it might seem obvious to use literature to teach reading, comprehension and grammar, I think it’s just as useful and engaging to use literature to teach and explore math! 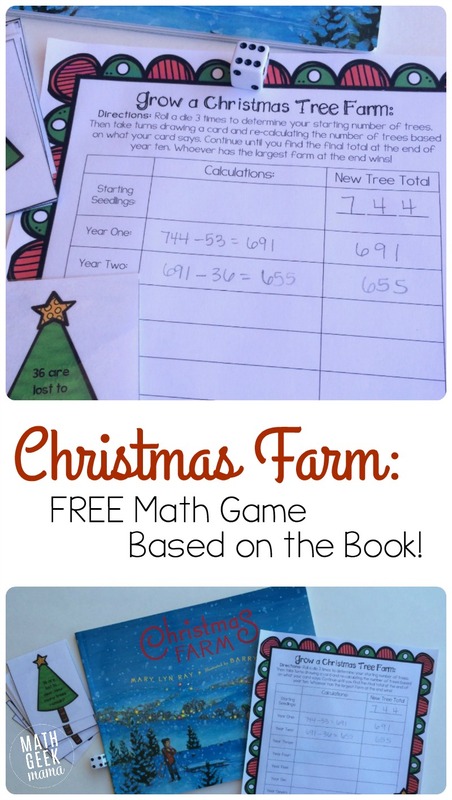 And so, at this time of year, when we are reading stacks and stacks of Christmas books, I’m constantly looking for ways to incorporate math into our holiday festivities. 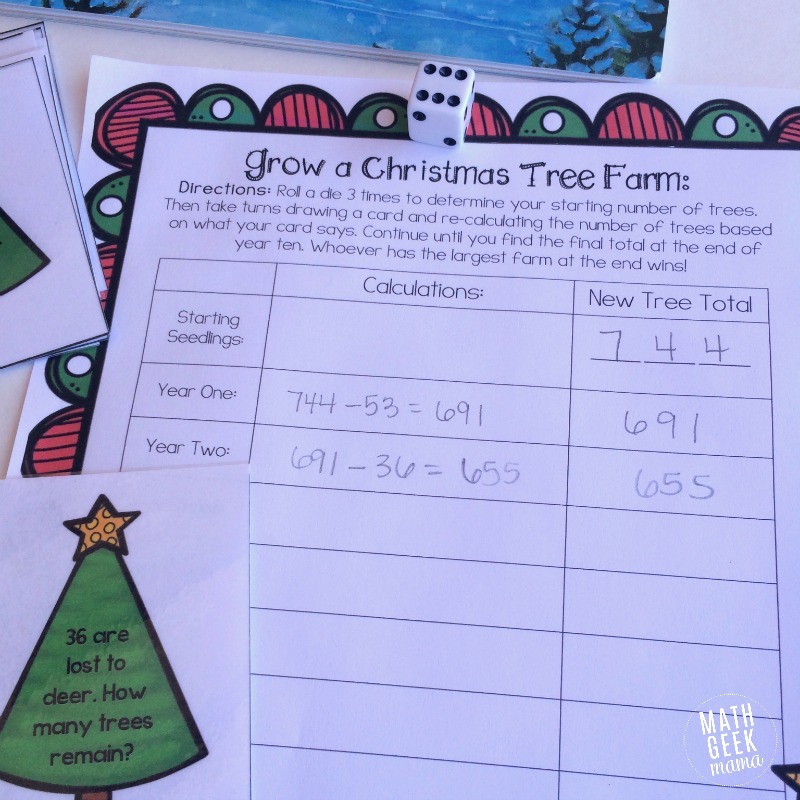 Today I’m sharing a Christmas Tree Farm math game based on one of my favorite books, Christmas Farm by Mary Lyn Ray. It is an absolutely beautiful story filled with lovely illustrations, but it is also a fun way to learn about how trees grow and to play with numbers! 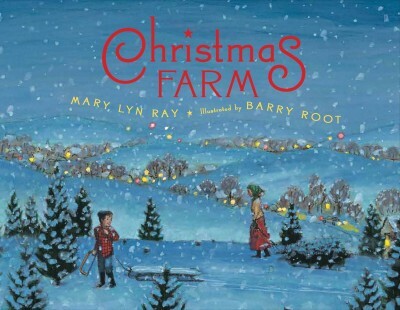 Christmas Farm is the lovely tale of Wilma and her neighbor Parker and their patience and hard work to grow a Christmas tree farm. I would recommend reading through this once with your kids just to enjoy the story. After reading through it, you can then read through it again and pay attention to all the numbers in the story. This book provides great, real life examples of calculating dozens, as well as dealing with large numbers. For instance, Wilma starts with sixty-two dozen trees. Talk about a dozen and ask your kids how to calculate the total number of trees. Each year, however, some of the trees are lost to mice, moose, snow and ice, but a great many remain. Ask your kids to calculate how many were lost each year. Depending on the age of your kids, they could use a pencil and paper, or work on their mental math skills. After reading the story, talk about the growth of the trees. Calculate their height in feet after each year of growth (there’s a chart given at the back of the book which gives height in inches). Try to determine the best number of seedlings to start with if you want to have 700 to sell once they reach maturity. This is a great, open-ended discussion, because it requires estimating, and has no right answer. After all, there is really no way to know how many trees will be lost each year, so how exactly do you determine how many seedlings to buy at the start? The possibilities for math discussions are endless! 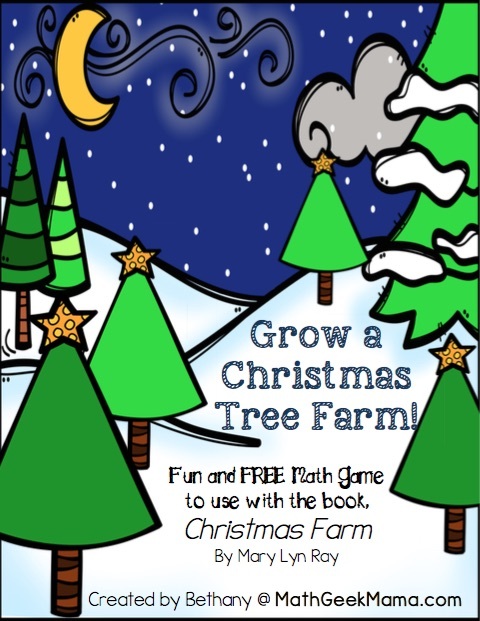 And if you would like to “grow your own tree farm,” play this Christmas Tree Farm math game together! The goal of this game is to have the largest tree farm at the end of ten years. First print out a recording sheet for each player. (Color and black and white versions are included). Then print out the Christmas Tree cards (also in color and b&w) and laminate for durability. You could even print on Christmas scrapbook paper so that the back has a fun design! Cut out the tree cards, and you’re ready to play! Before play begins, each player needs to determine their starting number of seedlings. There are two options for this. One option is to have every player roll a die three times and fill in their 3-digit starting value. (For example, if you roll a 3, 6 and 5 your starting number would be 653). A second option would be to have everyone start with the same number of trees. Either determine this ahead of time, or use the same amount as Wilma in the story (744). Once everyone has their starting number, take turns drawing cards. Each card will indicate that you either lost trees that year or planted more. Add or subtract trees from your starting value accordingly. Take turns drawing cards for each year on your recording page. Then for each year on your recording sheet, continue to add or subtract from your new total depending on what your card says. After everyone has calculated their final total at the end of year ten, whoever has the largest Christmas Farm wins! 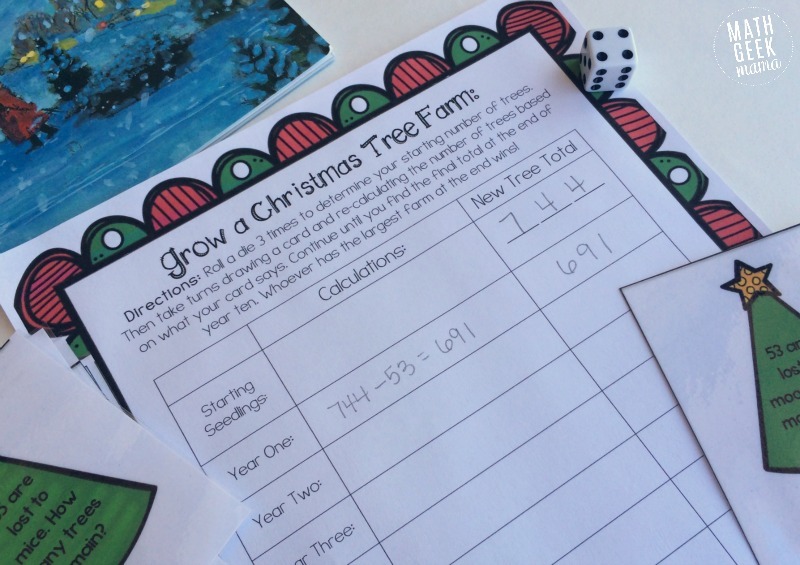 Looking for more Christmas math ideas? Try one of these! Sounds like a great challenge! Thanks for sharing at the Thoughtful Spot! I never even imagined using a story to teach maths and this sounds like a perfect one. I love Christmas stories, so this would be great.